Nowadays a steady growth of the SaaS market share is pretty obvious. It slowly but surely takes upper hand above On-premise solutions. By the next year (2018), the worldwide share of SaaS ERP applications should grow up to 38.5% (from 23,5% in 2013). Consequently, On-premise solutions share will drop to 61.5% (from 76.5% in 2013). That’s according to the IDC market forecast for 2014 – 2018 years. Today, in 2017 it is pretty hard to find any ERP application that wouldn’t support SaaS model of distribution. Especially amongst the new ones. But what is the reason for that, and what is SaaS ERP itself? Let’s find it out. What does SaaS ERP stand for? First, SaaS (Software as a Service) should not be confused with “Cloud”. Because SaaS is just a software licensing and delivery model which is only a part of the Cloud computing technology family. So SaaS in some cases can be called “Cloud”, but doing it vice-versa would be totally wrong. 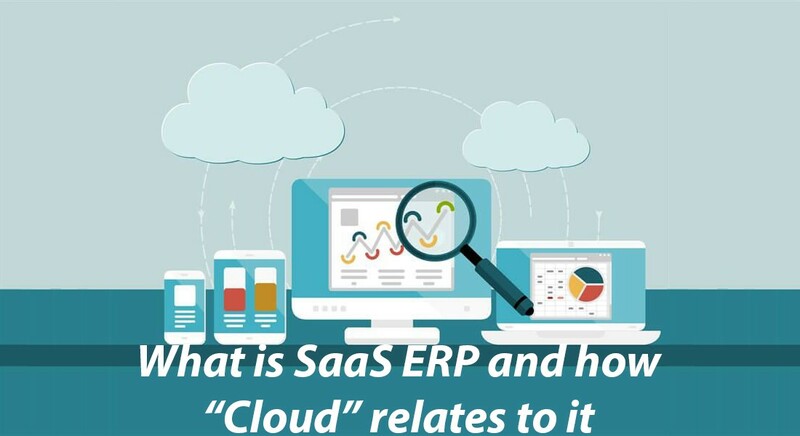 Hence, we now know the difference between SaaS and Cloud, let’s further describe what SaaS ERP is. As we have mentioned it is a model of a software licensing and delivery, and here you deal only with the application itself. Usually, you are not supposed to have an access to the code, back-end or hardware infrastructure. Or such access can have a limited form. In the case of ERP (enterprise resource planning) software – developer company or just a provider of the SaaS ERP software is basically leasing you the application itself and the necessary infrastructure and resources for its hosting and maintenance. Therefore you don’t have to bother with its hosting, maintenance, and updating or other related issues. The software is usually hosted on a developer’s web server or on a third-party provider, those are usually referred to as an application service provider (ASP). In terms of costs, it means that you simply rent or license that ERP application for a protracted period of time. As a rule, you are charged on a time period basis (most often monthly). Despite all the benefits of SaaS ERP solutions, there are actually a few drawbacks. And those are usually seen in comparison with On-premise solutions. So, we will do the same. Lower cost and predictable expenditure cycle. It is usually lower in every aspect like: initial cost, implementation, maintenance, upgrade. That’s because you don’t have to deal with all that. As you can see on the example of this calculator, typical SaaS solution reaches the expenditure level of On-premise solution only in 10 years. Reduced implementation time. The most time-consuming part of the implementation is personnel training and adjustment of the soft to your business. Hardware requirements are minimal or there are none at all. It usually takes from a few weeks to a few months. Unlike with the On-premise ERP, where such time-frame can be used for just a hardware adjustment and implementation. Minimum maintenance requirements. With SaaS ERP solution in case of some problems, you commonly deal with vendor’s support service and don’t need to hire a specialist. While with On-premise, a staff qualified specialist(s) in nearly a must-have. Better stability and frequent updates. You are not bothering with those at all. Your vendor, as a rule, just informs you about coming update and necessary actions for that. Plus, the price for those is already included in your regular payment. Mobility. As the majority of SaaS ERPs were made after the boom of mobile devices, they are initially mobile friendly. But the quality of such mobile integration may vary drastically. Fewer customization possibilities. You rent a turnkey solution, which might not be perfect for your particular business. Whether it is not a big deal for a small company, it is a crucial point for the big one. Yet, a lot of companies provide customization possibility for its products but those usually come at a cost and are no match for the On-premise solutions. Security issues. Your safety is in the hands of your vendor. And again, it might be a good news for the small company, as you don’t have to pay for that. But, as your company grows, the risks and the consequences of losing the data grow exponentially. First. On-premise solutions appear to be more customizable. For lots of companies, the possibility to customize the application specifically for their needs and requirements is essential. Especially in niche industries, such as specialized product manufacturers with complicated and unique processes. Smaller companies with less specialized needs, like online retail stores, can get by with the functionality provided by regular SaaS ERPs, which are present on the market in abundance. Thankfully to the enormous competition on the ERP market, there are dozens of applications available. And all of those do their best to deliver some unique functionality to fill some specific niche. Plus, lots of companies propose comprehensive customization possibilities, which, surely, will cost you, but it might be worth it. Second. Security is one of the biggest concerns for ERP buyers. Sure thing, the data, stored in ERP system is vital for any company. Clients contacts, employee information, financials, product lists, inner correspondence, various corporate secrets. And imagine all that data just lost thanks to server failure. Or, what’s even worse, it is in hands of some imposters. But let us reassure you. Today, SaaS ERP developing companies invest lots of money in security. They have strict standards according to data safety. Also, they apply the same standards towards third party cloud services vendors. The best evidence to the high level of security responsibility among those companies is constantly rising adoption rate of SaaS ERP systems. So, is the SaaS ERP a way to go? It definitely is! Whether you are a small business or a decent company, you’ll need a reliable software for a fair price. The price is the main factor on the side of SaaS ERP solution. An extreme competition between ERP developing companies guaranties that you will always get the best price and constant updates. Plus, such huge variety of the SaaS ERPs somewhat compensates their limited customization possibilities. The best part of it is that if you feel you have overgrown your SaaS ERP, you can always negotiate with your vendor and switch to the PaaS (platform as a service) or IaaS (infrastructure as a service) model. Such possibility usually hides under various “Enterprise” payment plan. But now you want to know what PaaS and IaaS models are. Well, that is the theme for a whole new article, which will come in short. So stay tuned and subscribe for our updates.